It is commonly known that when a ship is sinking, the crew does not board the lifeboats before the passengers. Most noble of all is when the captain and crew go down with the ship. Then with what level of ignobility should we assess the so-called “Syrian Civil Defense” more commonly referred to as the White Helmets? We are told that Syrian forces backed by Russian airpower are brutalizing the remnants of “rebels” in southern Syria near the Jordanian border and the Israeli-occupied Golan Heights. Surely now more than ever do the people of southern Syria need the “bravest of the brave” – as UK Foreign Secretary Jeremy Hunt described them on social media. Yet instead of rushing to where the cannons sound loudest, the White Helmets slunk across Syria’s borders with the aid of the Israeli Defense Forces, onward to Jordan, where the UN is working to relocate them – allegedly to Europe and North America. It is a final act laying to rest once and for all a monumental lie – that the White Helmets were anything more than an extension of the foreign-funded proxy war aimed at overthrowing Damascus. And now that overthrowing Damascus is no longer a possibility, the White Helmets are being evacuated to lie another day. The White Helmets were never “rescuers,” but a public relations wing of Al Qaeda and its various affiliates. The US did not arm and funded terrorists for years to ravage Syria only to “also” fund groups to help save lives. Instead, the White Helmets’ only real mandate was to augment the proxy war, exploiting humanitarian themes similar to how the US and NATO justified and executed the destruction of Libya. Videos of clearly uninjured individuals – showered in dust and red paint – rushed to awaiting ambulances often feature more cameramen in the frame than supposed rescue workers. Absent from the vast majority of the White Helmets’ videos is the actual gore, horror, and misery of real war – gaping wounds, dangling or missing limbs, burnt flesh and hair – all the horrors real Syrians faced daily since 2011 when the US-backed proxy war began. 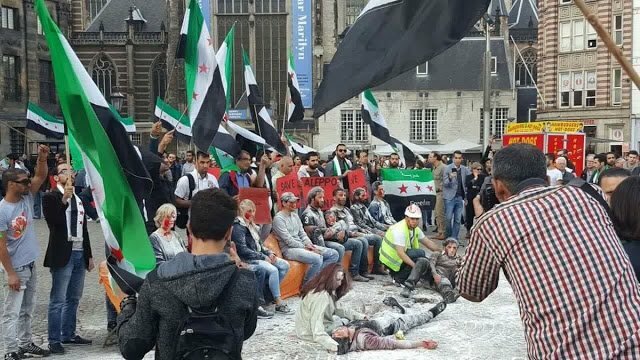 During the 2016 “Save Aleppo” protests held by the Syrian opposition across Europe, actors were dressed up, dusted and painted up with artificial blood, then posed in scenes indistinguishable from their Syrian-based counterparts’ videos. What was supposed to be another emotional gimmick aimed at manipulating the Western public to back wider Western military intervention, instead served as an indictment of precisely the game the White Helmets had been funded by the US and British governments to play amid Syria’s ongoing war. The White Helmets, officially known as the Syria Civil Defence, is a humanitarian organisation made up of 3,400 volunteers – former teachers, engineers, tailors and firefighters – who rush to pull people from the rubble when bombs rain down on Syrian civilians. They’ve been credited with saving thousands of civilians during the country’s continuing civil war. They have also exposed, through first-hand video footage, war crimes including a chemical attack in April. Their work was the subject of an Oscar-winning Netflix documentary and the recipient of two Nobel peace prize nominations. Indeed, the White Helmets have provided evidence of chemical weapons attacks – as noted by multiple OPCW (Organisation for the Prohibition of Chemical Weapons) reports – but it is evidence the OPCW has never been able to verify. The reason why the OPCW was never able to verify the evidence was because the White Helmets who allegedly collected and transferred it over to OPCW investigators operate exclusively in territory held by terrorists fronts – most notably Al Qaeda’s various affiliates. …it was determined that the risk of a visit to the incident area would be prohibitive for the team. Therefore, the team could not visit the site shortly after the allegation to observe, assess, or record the location of the alleged incident, could not canvass directly for other witnesses, and could not collect environmental samples and/or remnants of the alleged munitions. Through liaison with representatives of several NGOs, including Same Justice/Chemical Violations Documentation Centre Syria (CVDCS), the Syrian Civil Defence (also known as White Helmets, and hereinafter “SCD”), the Syrian American Medical Society (SAMS), and the Syrian Institute for Justice (SIJ), the FFM identified a number of witnesses to be interviewed. These witnesses were expected to provide testimony and potentially relevant evidence. At the time of handover, the team was informed that all samples provided on 12 and 13 April 2017 were taken by the chemical sample unit of the SCD [White Helmets]. A member of the chemical sample unit who took the samples was present at the handover and provided information on every sample. Idlib province, where Khan Sheikhun is located, is mostly controlled by the Tahrir al-Sham alliance, which is dominated by the Fateh al-Sham Front, formerly known as the al-Qaeda affiliated al-Nusra Front. Thus, the OPCW was not able to visit the site because it resided in territory occupied by Al Qaeda’s Syrian branch, Al Nusra. This fact is also why we do not see Western media personalities on the ground embedded with their supposed “moderate rebels,” because none exist. The White Helmets – however – are wherever Al Qaeda is – and it was Al Qaeda’s “cameramen-corpsmen” who supposedly responded to the Khan Sheikhun chemical weapons attack, allegedly collected samples, and passed them to the OPCW. Because there was no onsite investigation and the samples the White Helmets handed to the OPCW could have originated anywhere, no conclusion regarding what attack if any took place could be made, let alone any blame be assigned for the attack. Yet the Khan Sheikhun incident prompted the United States to carry out an assault on Syrian targets with 59 cruise missiles. 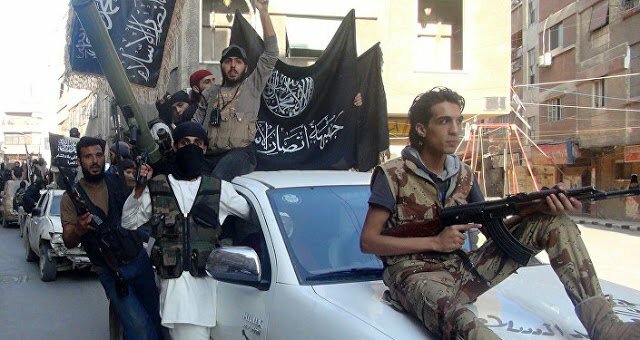 It was a clear case of US-funded provocateurs staging an incident, the US rushing through justification to strike Syria by sidestepping evidence or lack thereof, and then the West collectively weathering the fallout as the June 2017 OPCW report was published, revealing the absolute lack of evidence linking the Syrian government to the attack. It is a pattern that has repeatedly played out – each time the OPCW being unable to access sites of alleged chemical weapon attacks because they reside in territory occupied by dangerous terrorists, the White Helmets’ “chemical sample units” handing over evidence impossible to verify, and the US rushing through military strikes on Syria before investigations can be conducted and reports are published and analyzed. Thus the White Helmets serve verifiably as a war propaganda tool – enabling the US to pressure Syria and carry out military strikes any time the Syrian government makes significant advances toward positions admittedly occupied by Al Qaeda. As to claims of the White Helmets “saving thousands of civilians,” this remains impossible to verify specifically because just as the OPCW has no access to territory the White Helmets and their Al Qaeda associates occupy, neither do independent organizations tasked with verifying anything else the White Helmets have claimed. For those like the Guardian who claim the White Helmets are merely the victim of an “online propaganda machine,” who admit the White Helmets are the primary source of accusations used as serial pretexts for Western military strikes on Syria – what other conclusion can one draw that the White Helmets are primarily war propagandists? Rescue workers don’t abandon the people they have sworn to protect. The White Helmets clearly never honestly swore to protect anyone. As Al Qaeda’s propagandists, they are being evacuated alongside militants and other support personnel cornered by the Syrian government’s advances. The UK is willing to offer asylum to some of the 500 members or relatives of the Syrian volunteer civil defence forces known as the White Helmets who have been rescued from Syria and evacuated to Jordan, the Guardian has learned. 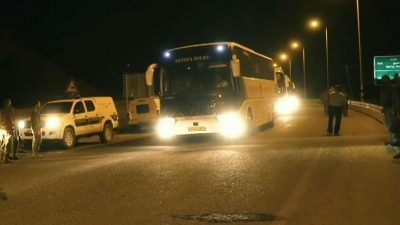 The White Helmets and their families were evacuated by Israeli defence forces on Saturday night, crossing from northern Israel into Jordan at three points. The Israelis had initially put the numbers evacuated at 800, but later the figure was revised downwards by James Le Mesurier, a former MI5 officer who is considered to have founded the group in Turkey in 2013. Thus, allegedly, hundreds of White Helmets – who worked with and for Al Qaeda – will now be scattered across Europe and North America. However, this in itself is not the White Helmet’s final performance. The northern province of Idlib still remains occupied by foreign-backed militants. What terrorists have not slipped over the borders and into Israel and Jordan are consolidating their positions in northern Syria. Some say it is not a matter of if, but when Syrian forces turn their attention north and begin seizing back Idlib. When they do, the White Helmets will be there, side-by-side Al Qaeda’s numerous affiliates, once again taking on the role of war propagandists – fabricating evidence and staging provocations to justify whatever their foreign sponsors’ desired role is amid the unfolding conflict. And even when the last White Helmet flees Syria or melts back into the Syrian population leaving real heroes to restore order, rescue the vulnerable, and rebuild the nation – the cynical gimmick the White Helmets represent will be repeated in other proxy conflicts, in other nations targeted by Western hybrid warfare. Nations should consider themselves warned – citing Syria as an example – that the West has used this tactic, and will use it again. The lessons Syria learned the hard way regarding all aspects of Western hybrid warfare must be shared and learned from to prevent the tragedy and misery the White Helmets claimed to rescue people from, but in fact sowed among the Syrian people.